This once-in-a-lifetime Junior’s Abroad trip is built around the Incan Empire, Machu Picchu, and the Amazon River. The Amazon basin (river and rain forest) is home to some of the most rare and endangered vegetation and wildlife on the planet. 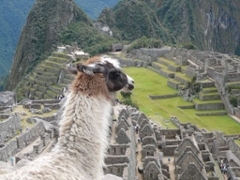 This trip will also explore the ancient Inca culture with an extended visit to the Machu Picchu ruins in Peru. We will experience Lima, the largest city in Peru, with all the food, dancing, industry, and culture it has to offer. We will travel to the ancient ruins of the Incan Empire in Machu Picchu and explore the history behind this advanced civilization. Special attention will be given to how the Inca’s lived and thrived and how the Spanish caused their demise. The Incan religious and political traditions will be studied. Traveling to the Amazon River will include boating trips, hiking excursions, and a trip through the canopy of the Rain Forest. Students will have opportunities to explore the mysteries of the Amazon from fishing for piranha, to the natives living along the river, to the marine life in the river, to the animals living and thriving alongside the river, and to the vegetation in, on and around the river. PM: Buffet Dinner, City Night Tour and Magic Fountains. Day 5 ICA-PARACAS, Sand Dunes: Ride the giant sand dunes in dune buggies and go sand boarding on the sand dunes. Day 6 Fly from Lima to Iquitos and the Amazon River! Our guide collects you from the airport; the transfer by bus from Iquitos airport to the Bellavista port is a 1/2-hour ride. On the way, we pass the fascinating vibrant jungle metropolis with historical roots in the rubber boom. We head towards the Bellavista harbor on the Nany River to board our speedboat for a 45-minute trip up the Nanny and Momon rivers. On the way, we observe the Nanay and Amazon River, you will note the “meeting of the waters” a blending of the Amazon which is brown and Nanay which is black water. (Sometimes you can see the pink or gray dolphins). We will appreciate our natural wonder that is the “Amazon River.” Upon arrival at the Lodge we are warmly greeted with a welcome drink made of local tropical fruits. Our Guide will explain the activities and he will give an orientation of the bungalows and the main facilities available at the Lodge. We have our first taste of the delicious food in our restaurant “The Hungry Monkey”. Free Afternoon: Boating, walking excursion or if you prefer, time to relax at the lodge such as the large swimming pool, the water slide, the Jacuzzi as well as going to the top of our two towers to enjoy the view or relaxing on the balcony overlooking the Momon river to watch the boats sailing by and observe the birdlife. Day 7 (Optional) We rise at the crack of dawn, around 05:30 AM, for an hour-long canoe ride up river to enjoy the great variety of bird life. Many bird species of the Amazon are active at this hour feeding on fruit trees and diving into the river to catch small fish. We hear their joyful singing as they fly around. After breakfast: Hike through the jungle to explore the rainforest. We visit the river communities of Gen Gen and Centro Fuerte where we will learn the customs and habits of the mestizo people who live on the river banks of the Amazon region. These “River People” are humble subsistence farmers and fishermen. In their small plots, they harvest manioc tuber and plantains. They use small canoes and fishing nets to harvest the abundant variety of fish in the river. We visit the Alamas’ Indigenous Tribe. They recently moved to our area and they have built a small community with a large communal hut where they offer us a typical friendly greeting. They dance and sing and perform their traditional rituals. They offer us their home-made handicrafts made out of local plants, seeds and wood from the area. After the delicious evening meal, we motor our way up river with our long canoe; after a while the Guide switches off the engine and in complete silence we drift downstream under the moon and stars, enjoying the chorus of nocturnal animals, fire flies, insects, frogs, birds, owls, jumping fish and other creatures of the night. Day 8 After breakfast, we will travel by boat to Piranha Park, a private reserve. It is a place to enjoy nature; there are five lakes, in one of them you can fish for piranhas, in another lake, there are other fish of the region, take a ride on a cayak; you can observe primates, a great variety of trees with long fibers and medicinal plants; you can see Victoria Regia, considered the largest water lilies; they have large round leaves measuring up to 1 meter in diameter. Day 9 Amazon River: We will visit an animal rescue center where you will potentially be able to interact and hold sloths, anacondas, and a number of other animals rescued on the Amazon River. Day 11 Cusco city tour and the 4 ruins. You will start early, being picked up from your hotel in transferred to the spectacular fortress ruins of Sacsayhuaman above the city. Here you have the choice of mounting up on local horses or continuing by vehicle to Tambo Machay, Puca Pucara, the Temple of the Moon and then to Q’enqo. The first half of the day concludes with a guided visit to the impressive Sacsayhuaman with views across Cusco. Our flexible itinerary allows you to walk down from Sacsayhuaman to Cusco (an interesting walk that helps in acclimatization for trekkers) or take private transport. After lunch, we will have a walking tour of Cusco, the ancient capital of the Incas and the “Belly button” of the world. Our afternoon visit includes the Cathedral, the Koricancha (Temple of the Sun) as well as eminent weaving houses in Cusco so you can learn a little about this living tradition of the Incas. Day 12 Shapes of the past tour: In this lovely one-day tour we visit Moray, perhaps the most unusual of the Inca ruins and then descend to Sacred Valley of the Incas, via the salt mines at Salineras. We take private transport from Cusco to Chincheros, where we will stop to visit the Market and an Awana Wasi, as well as the ruins of Chincheros and the Colonial Church. We continue on to the village of Maras and then to Moray. A pre-Inca site, though used by the Incas, Moray is a series of agricultural terraces, which were believed to be an experimental agricultural station for different crop strains. We spend about one hour exploring these huge amphitheaters before heading back cross-country through traditional farmland to the charming village of Maras. Walking along the cusp of the Sacred Valley we are rewarded with views of the opposite snowcapped mountains. We lunch en route. We visit sleepy, charming Maras before heading downhill to Salineras, sometimes meeting large numbers of donkey trains carrying the salt uphill. Salineras is a collection of watered terraces that take salt from an underground salty stream, which is collected by locals through a fascinating process of evaporation. massive pisonay trees. We will have lunch in Urubamba before visiting a traditional ceramics factory where we can purchase beautiful earthenware. We then continue on to Ollantaytambo with its impressive Inca fortress that guarded the entry of this part of the valley and protected it from possible invasion from the lower jungles. The fortress consists of a series of superimposed terraces of carved stones accessed by long staircases. The design of Ollantaytambo village and the majority of its foundations date from the Inca era when it was a strategic military, religious, and agricultural centre. Day 15 Machu Picchu tour: You will be up before dawn to take one of the first buses up to Machu Picchu, beating the crowds and having the opportunity to see this World Heritage site in the early morning light. You will have a 3-hour guided tour of the site. Spend time exploring this amazing site, before taking the bus back down to Aguas Calientes. Day 17 Cusco – Puno: After breakfast we will pick you up from your hotel and start the trip to Puno. Upon arrival we will transfer you to your hotel in Puno. Day 18 Lake Titicaca Homestay: At 13,500 feet, Lake Titicaca is the world's highest commercially navigable body of water. The Incas believed it was the cradle of civilization - the place where all life began. It's a very special place dotted with islands that have unique living cultures and traditions, two of which we'll visit today. The first is the famous manmade Uros Reed Islands, where we’ll have a tour and an explanation of the unique way of life of the people who live here. Then we’ll head for Amantani Island, where we'll spend the night. Our hosts, members of the indigenous Quechua community, will meet us at the lake's edge and are always up for a game of high-altitude soccer! When the game is over, we'll hike to the Pachamama (Mother Earth) temple at the summit of Amantani Island for unforgettable views of the sun setting over Lake Titicaca. Later we'll return to the homes of our hosts for a home-cooked meal. The Quechua people have maintained their traditional way of life for centuries, weaving wool, keeping cuy (guinea pigs), and farming their smallholdings. It's very quiet here - no streetlights, no cars, no dogs even!